RAWALPINDI: The police in collaboration with local administration and religious parties claim to have comprehensive security plan in place to ensure a peaceful Muharram after last year’s incident when at least eight people were killed and over 80 injured in sectarian clashes in front of the Madrassa Taleemul Quran in Raja Bazaar. The Islamic month is being considered the most sensitive and extremely vulnerable period as far as law and order is concerned owing to rising sectarian target killings in the twin cities. “A state of highest alert is to be maintained by imposing a curfew-like situation,” said City Police Officer Humayun Bashir Tarar. The CPO said special emphasis will be given on the deployment of force on the venue of majalis and processions. According to the plan, Tarar informed, all intelligence agencies, including the special branch, CID, SIU and district security branch, will be coordinating to avert any violent and tragic incident and keeping in view the threat perception at each place and its topography, special deployments will be made on rooftops of buildings at important venues. Leaves of police personnel will also not be entertained in the time period. Hey, CAIR, not making this up. 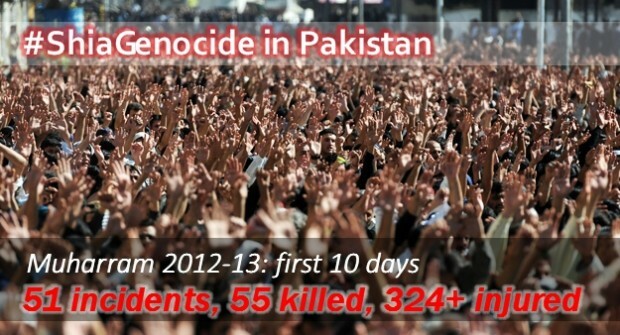 Killing Shi’ites is a sport in Pakistan. I bet you CAIR guys don’t like them much either. The Mourning of Muharram, Remembrance of Muharram, or Muharram Observances, is a set of rituals associated with Shia Islam, which takes place in Muharram, the first month of the Islamic calendar. Many of the events associated with the ritual take place in congregation halls known as Hussainia. The event marks the anniversary of the Battle of Karbala when Imam Hussein ibn Ali, the grandson of the Islamic prophet Muhammad, and a Shia Imam, was killed by the forces of the second Umayyad caliph Yazid I at Karbala. Family members, accompanying Hussein ibn Ali, were killed or subjected to humilation. The commemoration of the event during yearly mourning season, from first of Muharram to twentieth of Safar with Ashura comprising the focal date, serves to define Shia communal identity. At present, Muharram Observances are carried out in countries with noteworthy Shia population, including Afghanistan, Iran, Iraq, Pakistan, Lebanon, India, and Bahrain. Within the lifetime of grandson of Mohammed the Muslims were at each other’s throats—already. Not a very good omen. Sure, Christianity has had its problems too. The Protestant Reformation was violent at times—but it took place over 1,500 years after Christianity itself emerged. And the bad feelings appear to have now vanished in a haze of disinterest.